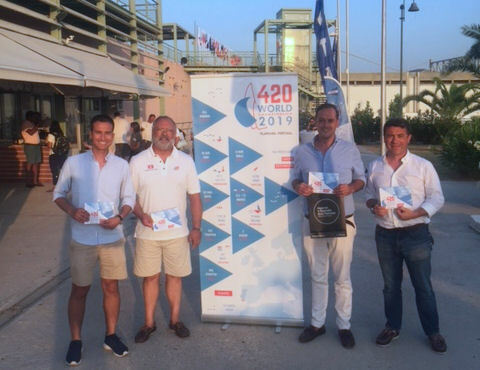 The 179 teams competing at the 420 Open European Championships spent the morning ashore as light wind postponed the scheduled 1200 hours start. 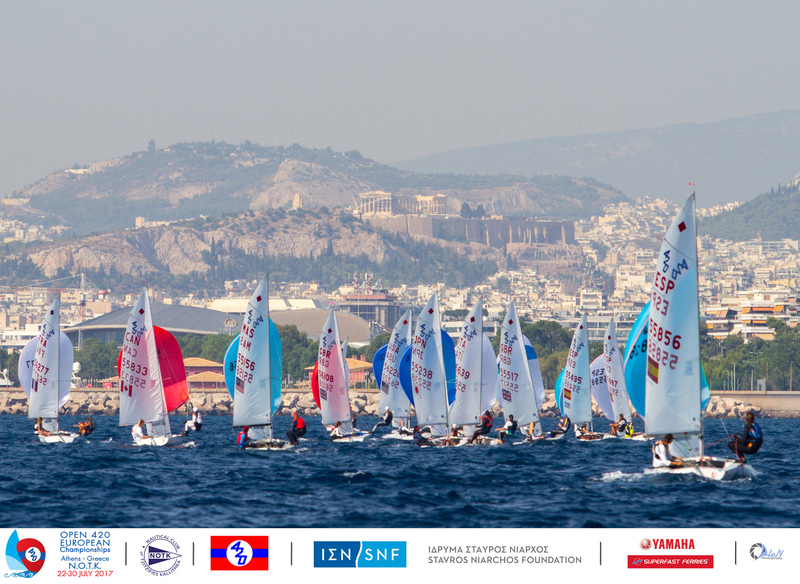 Racing for the three racing divisions – Open, Ladies and U17 – is over two races courses in the Saronic Gulf, set against the iconic background of Athens and the breathtaking ancient site of the Acropolis. 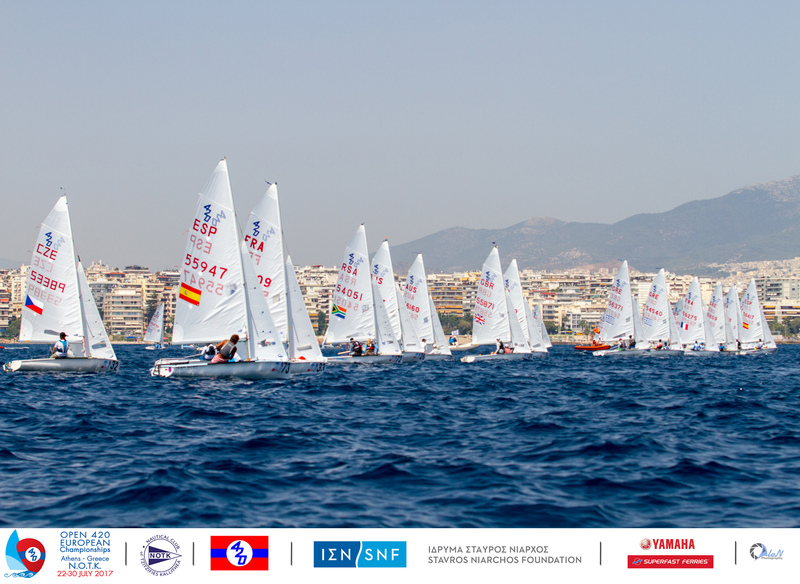 Around 1420 hours the thermal breeze filled in and the Open fleet headed out to the race track, and launched into their opening race at 1510, followed by the other fleets soon after. Racing on day 2, Wednesday 26 July, is scheduled to get underway at 1400 hours with two races for all fleets. 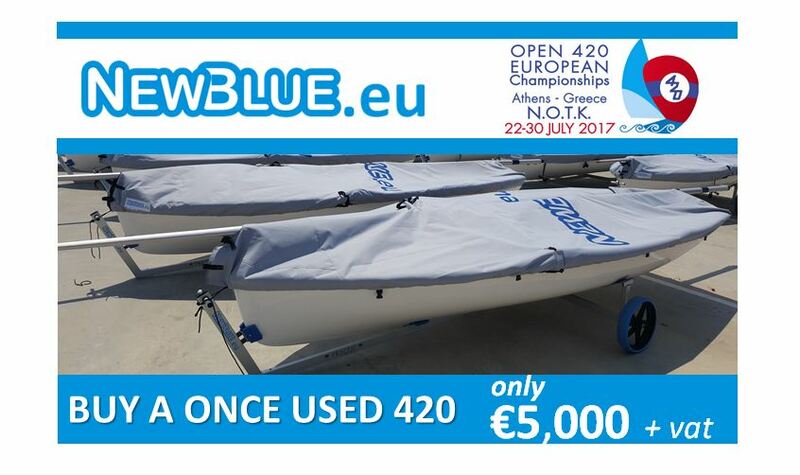 The seventy-seven teams in the 420 Open event are split into yellow and blue fleets for the 6 race qualification series, before advancing to gold and silver for the 6 race final series. 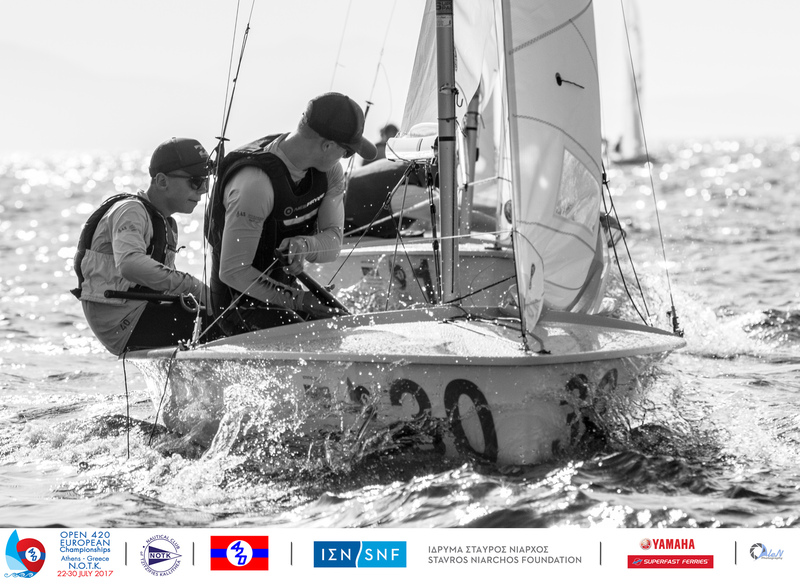 Racing got underway at 1500 hours, and making a mark on day one amongst the 20 nation line-up were Francesco Crichiutti/Francesco Ripandelli (ITA) who led the yellow fleet to the first mark. The attack from behind was strong as multiple teams jostled to take them out, but the Italians held on to take the win. 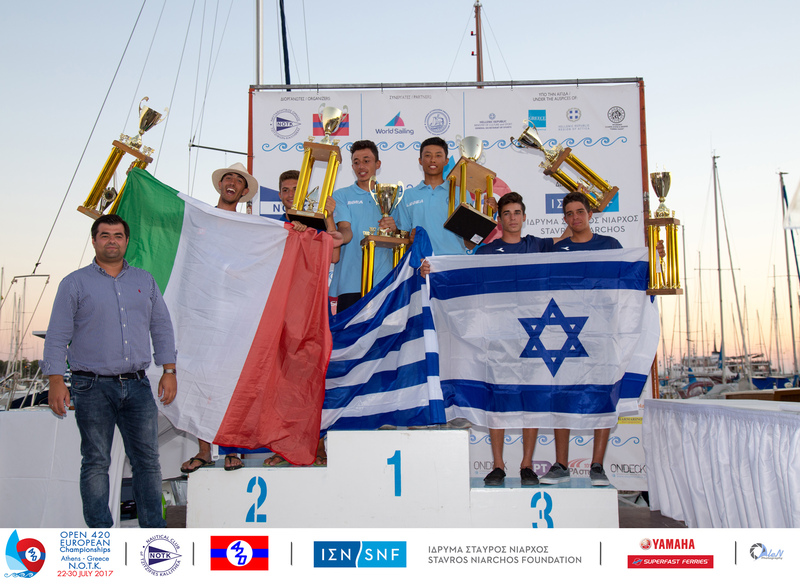 In the blue fleet, after a general recall, Rotem Shental/Nir Shental (ISR) took the early running, but were overhauled by Greece’s hugely successful partnership of Telis Athanasopoulos Yogo/Dimitris Tassios who seized the win. All change in race 2, with a different set of faces pushing out front, with the yellow fleet win going to Portugal’s Manuel Ramos/Gonçalo Ramos, and France’s Tristan Peron-Philippe/Corentin Bretagne overtook Spain’s Álvarez/García in the final leg to control the blue fleet. 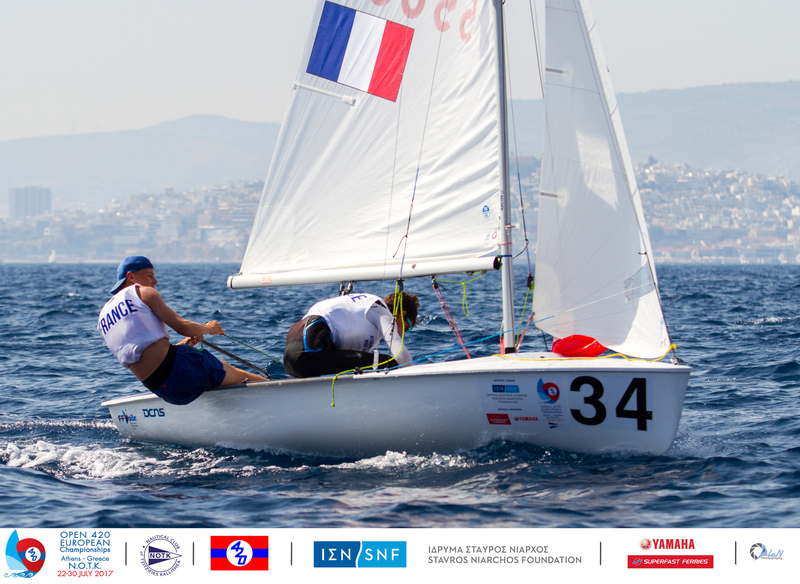 Two races down and sitting pretty out the front Peron-Philippe/Bretagne, over Great Britain’s Alex Smallwood/Ross Thompson who scored 2,4 for second place and third to Telis Athanasopoulos Yogo/Dimitris Tassios on 7 points. Not the usual opening performance from Italy’s Francesco Orlando, who is into his fourth year of competing at 420 Championships and hugely experienced with a pedigree to prove it, along with helm Edoardo Ferraro. 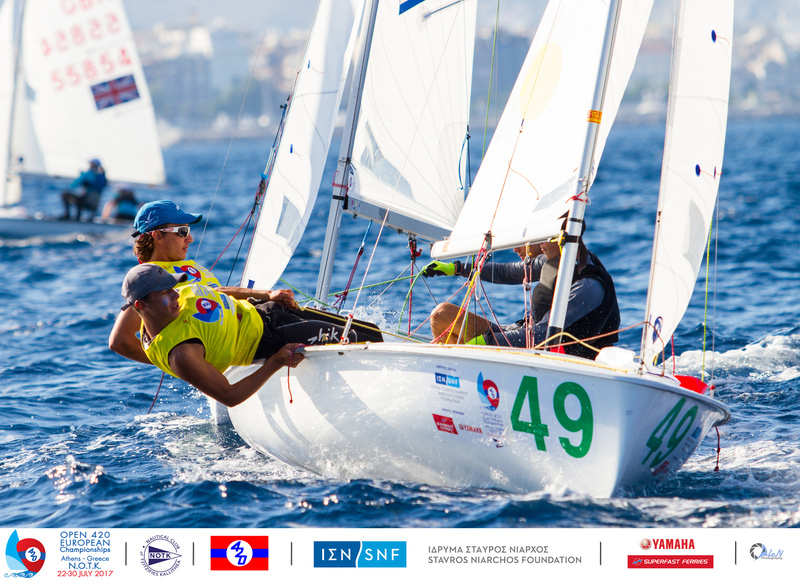 U17 World Champions in 2015, 8th at the 2016 420 Junior Europeans, 15th at the 2016 420 Worlds and a 5th at the Youth Sailing Worlds, are more than enough evidence of a formidable partnership. Their scorecard of 1,4 positions them in 9th overall after day 1. 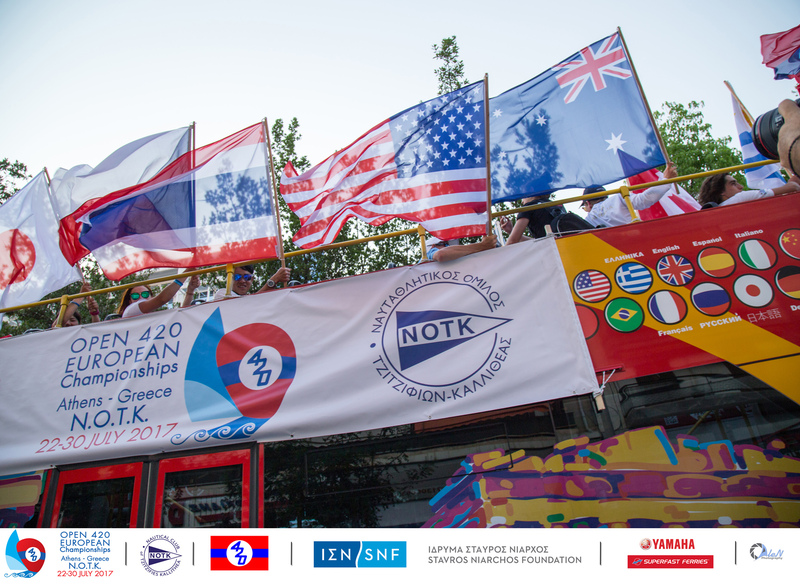 Fifty-seven teams from 16 nations faced off for the first of six days of racing. 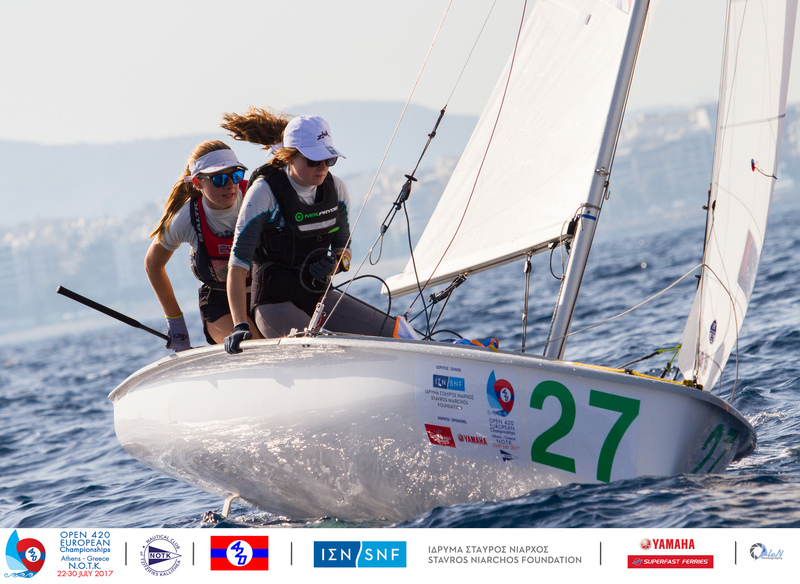 A start to be proud of for Violette Orange/Camille Orion, as the French Girl’s National Champions, bucked the fleet to take the opening win. 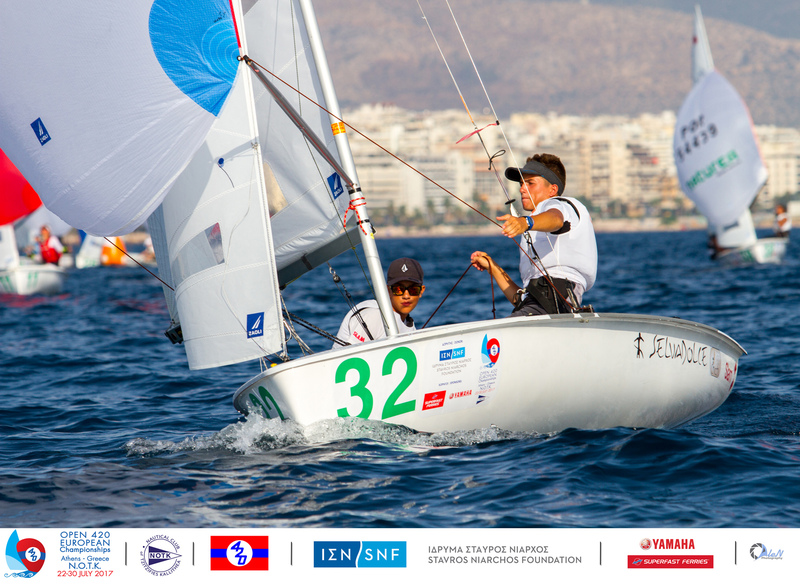 A black flag penalty in race 2 saw their success converted to a 28th overall. 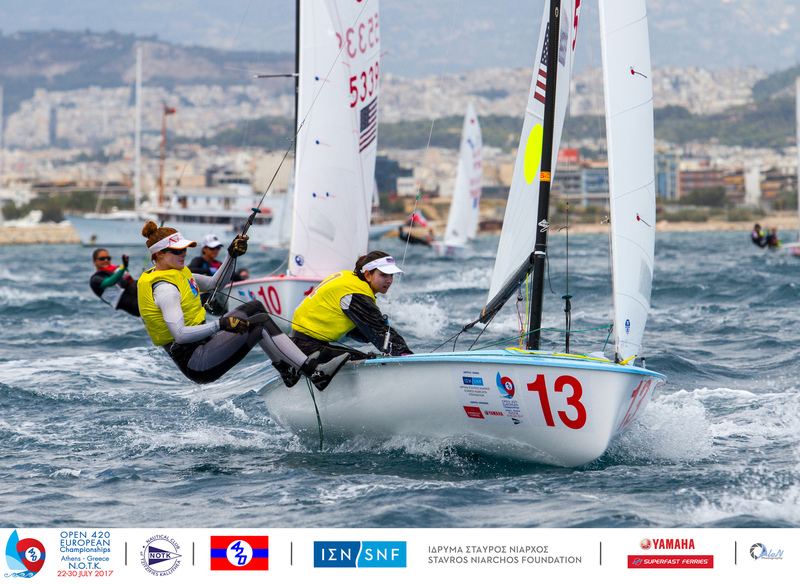 The USA is fielding a full quota of seven Ladies teams, combining a mix of experiences and rookies racing their first 420 Championship. The nation holds 1st and 2nd overall with Emma Kaneti/Ciara Rodriguez-Horan and Carmen Cowles/Emma Cowles respectively. 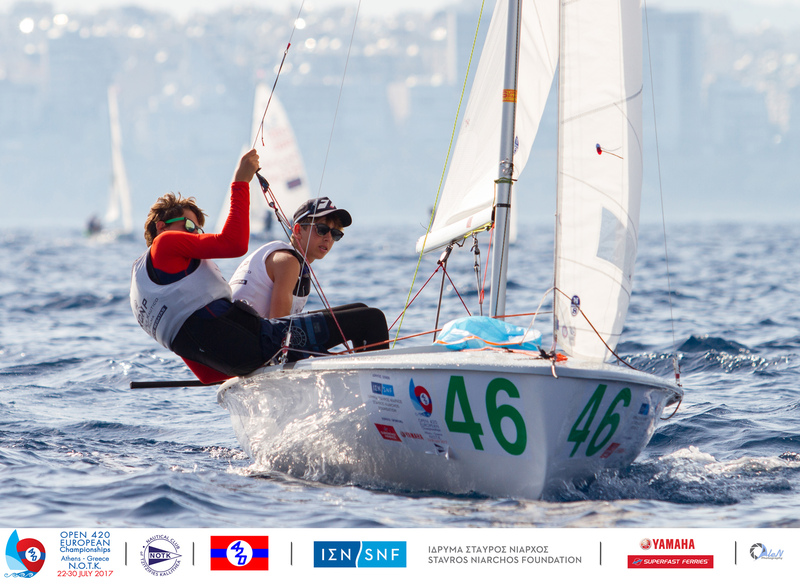 Third to Spain’s Julia Miñana/Silvia Sebastia. 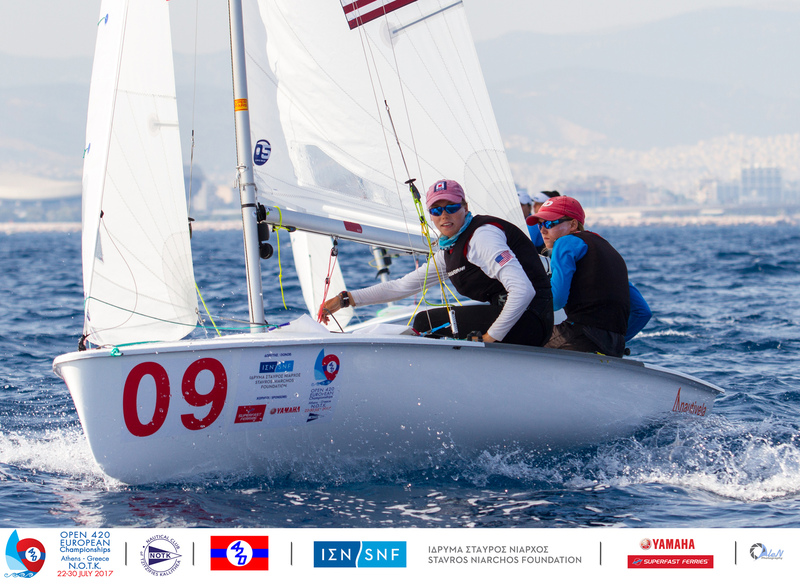 Kaneti is an old hand, having faced the fleet at last year’s 420 Worlds, where she finished 22nd overall, scoring several top 10 results. 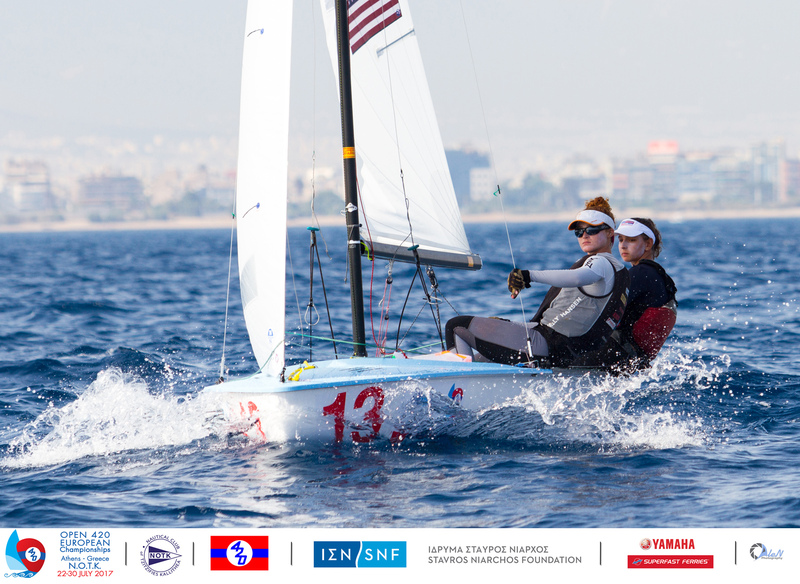 Her scorecards since then include a sixth and second girls’ team at the 2017 US Sailing Youth Championships last month. “I did pretty well last year, a 22nd, and am hoping to improve on my results, and then we will be heading to the Junior Europeans,” Kaneti added. 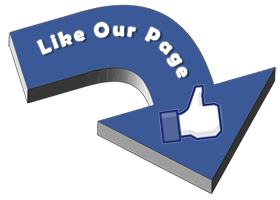 She certainly achieved that goal, racking up a 4th place in the opening race, and followed up with a win in race 2. 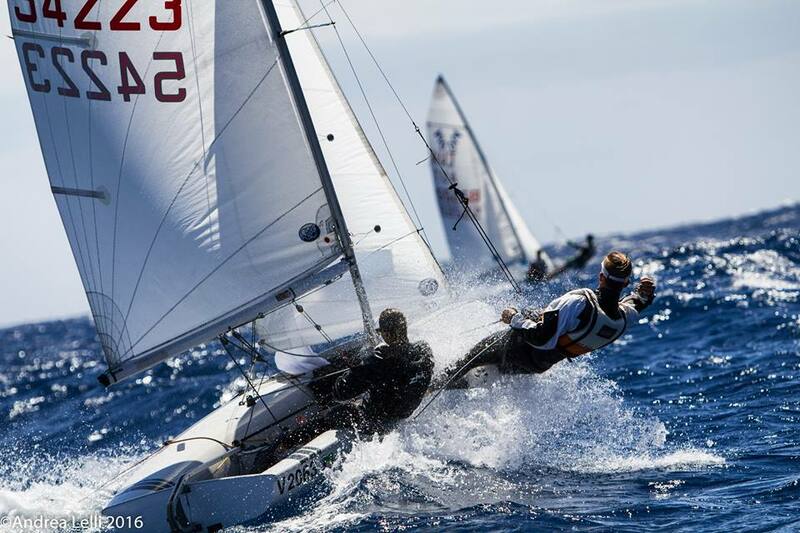 From experience to newbie, as team mate Gabriella Del Bello competes at her first ever 420 Championship, so planned a conservative approach to the racing. “I am aiming to stay consistent in the racing,” Del Bello said, “as this is our first time, and we just want to feel it out.” A sensible call, in a highly talented fleet places her in 17th overall with helm Michelle Lahrkamp. 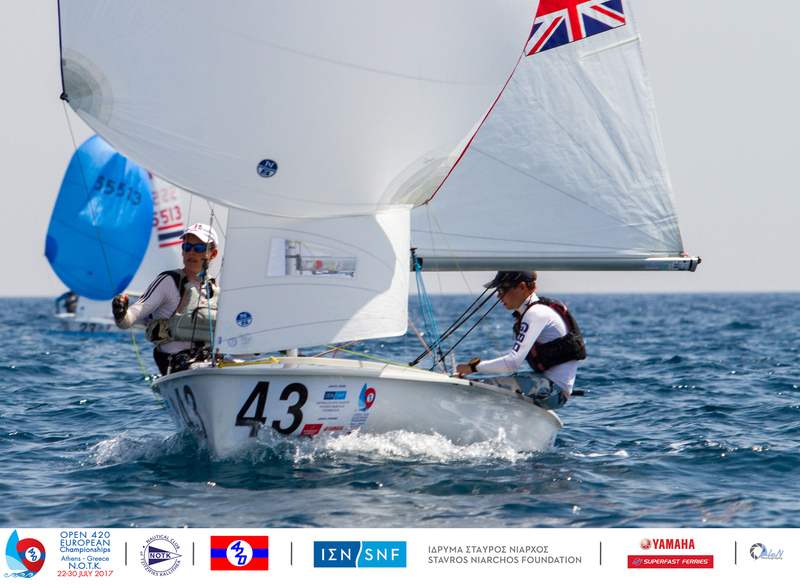 A determined start from Indonesia’s Farah Asima/Nur Fatin Syafika, who are competing with the support of the 420 Development Programme, gave them a scorecard of 52,32 and 47th overall. 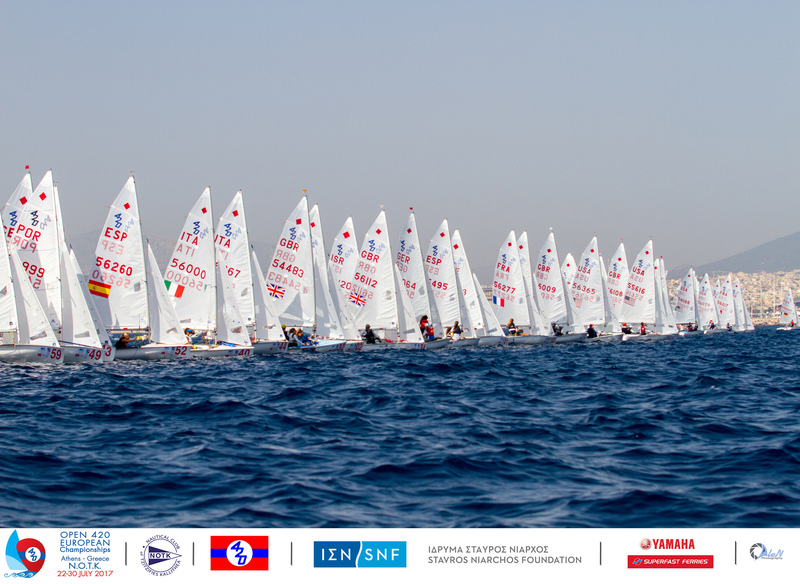 The 45 entries in the under-17 fleet are racing a 12-race series. 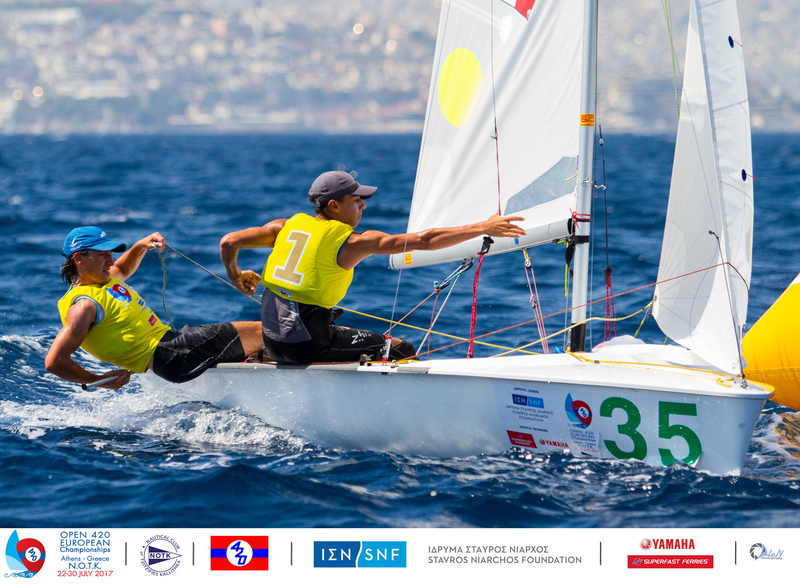 Opening on a winning scorecard were Italy’s Demetrio Sposato/Gabriele Centrone, in a race that saw the pair lead from start to finish. 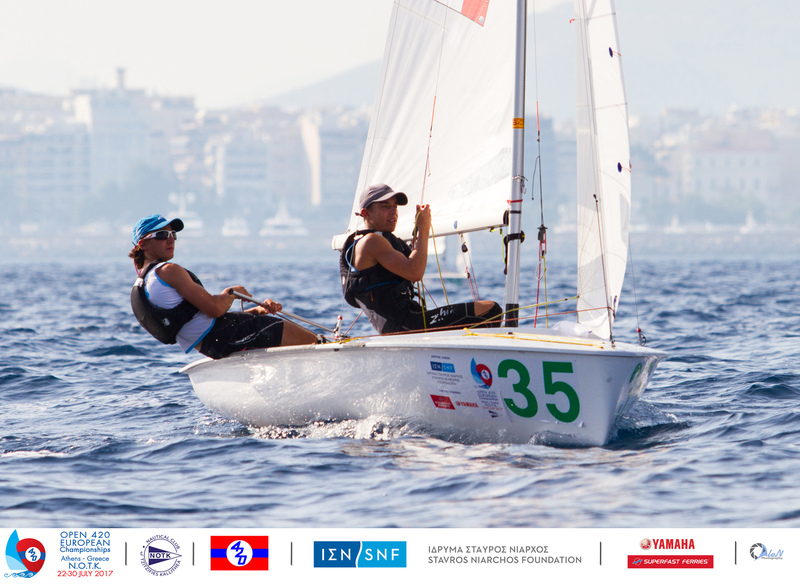 They repeated in race 3, finishing in 3rd to lead overall. Second to Great Britain’s Rhys Lewis/Drew Wright and third to Pablo Ruiz/Miguesl Martinez/-Fortun of Spain. Top girls team are Great Britain’s Julia Mellers/Ellen Main in 5th overall.